Pimpin Aint Easy anniversary birthday hong kong HK club cliq dj rafik germany turntablist enso kid fresh pae p.a.e. Pimpin’ Ain’t Easy, a monthly night that champions new styles of dance music is celebrating their first anniversary on Friday, August 7th. Over the course of one year, the somewhat under-appreciated party has brought over a dozen up and coming international d.j.s to Hong Kong. P.A.E. has also filled a niche in the city’s nightlife landscape. Where other clubs such as Dragon-i and Volar bring major names, P.A.E. showcases rising talents who are just beginning to make waves on the global scene. Organized by d.j.s Kid Fresh and Enso, the night has added a new level of professionalism to club promotions around town. 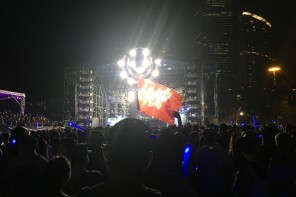 Not only do they have quality music, but their invitations and street promotions are a step above the rest of H.K.’s clubs. Through their hard work they have succeeded in creating an identity for their night. The Pimpin’ Ain’t Easy party provides an alternative to the monotonous Hip-Pop and R&B featured in the majority of Hong Kong’s clubs. If you’re interested in discovering something new and want to groove to more underground and contemporary sounds, this is one of the few places you can go. Headlining this week’s party is d.j. Rafik, a member of the same German d.j. crew as Kid Fresh. 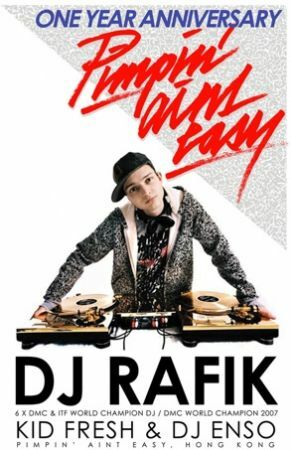 Rafik comes from a musical family and is an accomplished turntablist who has won multiple championships. Pimpin’ Ain’t Easy d.j.s are not confined to any one genre. Many of them are turntablists who have grown disillusioned with Hip Hop’s stagnation and are branching out in other directions. Partially what keeps their parties fun is that the d.j.s are masters of genre blending. Friday night will feature two rooms at Cliq, with d.j.s Kid Fresh and Enso playing in addition to Rafik. With free entry for girls and a reasonable cover that includes two drinks for guys, the night should be well attended. Girls free all night, $200 HKD for guys, includes two drinks! Previous articleRoxie: Hong Kong’s sexiest new nightspot? Next articleMy Checker Box – capsule toys for adults?